I’m sure it’s not news to anybody: it’s freakishly cold outside. In Chicago we’ve had record snow fall and low temperatures. Everyone told me that last winter was mild, but I can honestly say that I didn’t understand until now. This storm has been a rude awakening for this Mississippi girl. Here’s how I’ve handled the worst cold front in 20 years. Do: Be thankful you have a job where people understand the difficulties the winter storm can cause commuters. (Or that you work in an old building where the reliability of the heating system is often questioned) Either way, I’ve been working from home the past two days. Do: Remember to go to the grocery store before the extreme cold hits. My grocery essentials: Diet Coke, frozen pizza, milk, and Ben & Jerry’s. Do: Be thankful that you purchased an Official Chicago Women’s Coat last winter. That thing certainly keeps you warm! Another bonus: if you should happen to fall down the icy stairs at the El station, your puffy coat will provide your bum with some extra padding. However, the coat will not shield you from the embarrassment of sliding down 6 steps before having a stranger stop you on your way down. Luckily everyone was so bundled up, I couldn’t see anyone’s face and I assume they couldn’t see mine. Don’t: Hesitate to call to call your landlord if you notice murky water in your kitchen sink. It is sewage water!! Gah-ross. I am the lowest apartment level, so when a pipe froze I was the first apartment to notice the water backing up. I’m so lucky. For the past two afternoons, I have had multiple Polish gentlemen in and out of my apartment attempting to fix the problem. Every once in a while I will hear an “Oh boy…” from the kitchen followed by Polish and clanging of pipes. The problem is still not fixed. Do: Make sure you have enough tv shows and/or movies in your Netflix queue to entertain you. You will not be getting much human interaction (except with your Polish property manager) so you are going to need some entertainment. I made the mistake of watching lots of t.v. over the weekend, which left me with slim pickins’ for Monday and Tuesday. 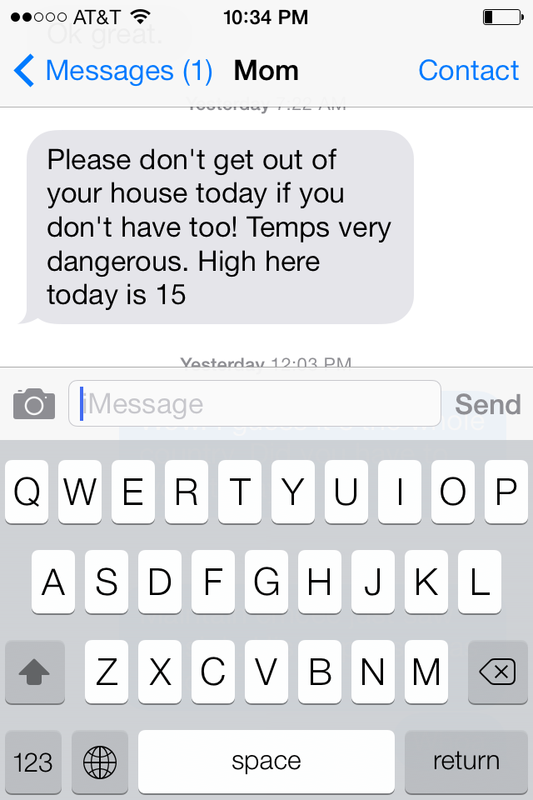 Don’t: Be surprised when you do go outside for a quick errand. Your nose hairs might freeze, but you will survive. Do: Remember to call your mom. She is probably worried about you and will require multiple updates. Stay Warm everyone! Don’t forget your hat and mittens. ← Ok, Cupid, Where are you hiding the normal guys?